The Ugandan government has responded to the European Union Parliament, days after the continental bloc’s parliament has called on the East African nation to drop charges against legislators. Members of the European Parliament (MEPs) in a resolution released last weekend made reference to the violent turn of events during a by-election in August in Uganda. 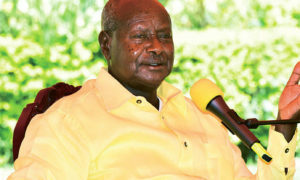 Last month, Ugandan police arrested three opposition lawmakers and scores of others after stones were thrown at the convoy of President Yoweri Museveni, who has been ruling the country since 1986. Robert Kyagulanyi, an independent lawmaker and musician who has gained popularity since he joined parliament last year and MP Francis Zaake were allegedly tortured after they were arrested. Kyagulanyi, known as Bobi Wine, said police shot at his vehicle and killed his driver. The government has denied that security staff tortured the two men, saying the injuries visible on their bodies could have been sustained in scuffles as they tried to resist arrest. Government spokesman Ofwono Opondo told a news conference on Monday that the EU parliament resolution asking the courts of Uganda to drop charges is inconceivable. “We see this as a premeditated attempt to hijack and subvert our institutions,” Opondo told reporters in the capital city, Kampala. He said the EU was hostile to Uganda because of “our emerging relations with China”. Posted by Geraldine Boechat on September 18, 2018. Filed under News. You can follow any responses to this entry through the RSS 2.0. Both comments and pings are currently closed.